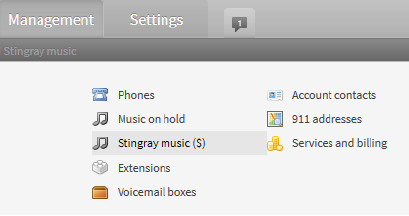 Administrator’s guide to enabling and assigning Stingray music to your phone system in Studio, Ubity’s online management portal. To obtain a password, you must request one on the interface (click on Recover your password) because Ubity does not have access to them for security reasons. Go to the Tools tab then Music on hold and click on Stingray music. You have the possibility to listen to a 30 seconds sample of each playlist to make your decision. To do so click on the Play button on the left of the line. Once your choice is made, you must activate the playlist by clicking on the button on the right end of the line. You will need to accept the “Terms and conditions” then Subscribe to confirm the activation of the playlist. Note: The monthly fees apply as soon as you subscribe. No commitment or rebates are applicable to this item. Go to the My Account tab then Extensions and click on . Click on Modify, located at the end of line corresponding at the extension you want. You are in the “extension” option. 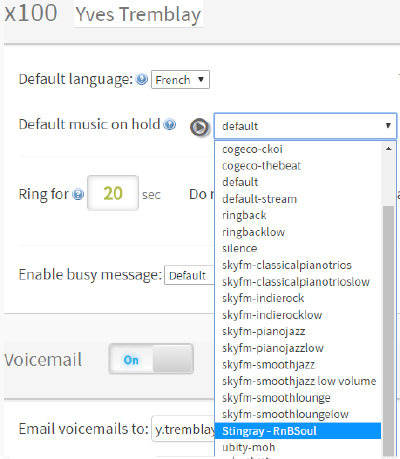 Look for the Default music on hold and by using the drop down menu, you can select the music that will be played to people you put on hold, people who contact you through the find-me/follow-me feature or yourself if you are ever put on hold by another Ubity user in your company. You may listen to the music by clicking on the Play button. In the Tools tab then Contact center and click on Queues, click this button, at the end of the line of the queue you want to modify. You will then be in the “queue” options. 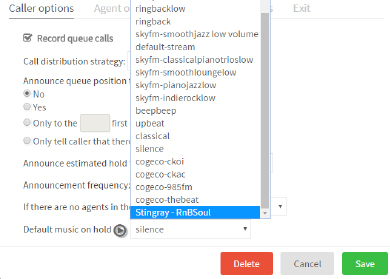 Look for the Default music on hold and by using the drop down menu and choose the playlist Stingray that you wish to activate. The music will be played as soon as the setting is saved. You can reach us anytime by emailing us at support@ubity.com or by calling our 24h Support department at 1.877.315.1920. Copyright © 2019 Ubity Inc.